Ruth Montgomery is a professional musician, teacher, workshop facilitator and visionary artist. As a classical trained musician with a passion for modern works, she also explores art, sign language, and visual media within the Deaf Community and features them in her current project titled Audiovisability. As a result this has led her to secure a place on the Clore Leadership Fellowship programme in 2018 – 2019. Music is what she grew up with and studied the flute with Chris Molloy to grade VIII level at Mary Hare Grammar School for the Deaf and continued with her flute and music studies at Trinity College of Music in London and The Royal Welsh College of Music and Drama, Cardiff. 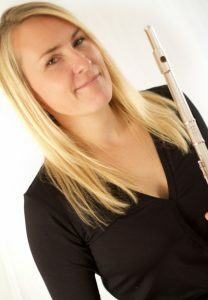 Ruth is currently based in Essex UK and has studied with some of the country’s most respected flautists including Roger Armstrong, Ann Cherry, William Bennett, Christine Messiter, Karen Jones, Patricia Morris, Wissam Boustany and James Kortum at the Univeristy of Newcastle in Australia to name a few. In 2005 she graduated with a 2.1 Bachelor of Music Honours degree majoring in Flute Performance at the Royal Welsh College of Music and Drama in Cardiff. Most adjudicators who assessed her degree performances had no idea that she was deaf. Unfazed by her deafness, she went on to work in the field of music. She was given the opportunity to perform with some of the world’s best orchestras as a soloist playing the Danzi Concerto with the Royal Philharmonic in London at Cadogan Hall and the Russian National Orchestra in Moscow and St Petersburg with the Music of Life Foundation, and with Dame Evelyn Glennie as a guest Soloist. Ruth’s musical experiences in Russia and London was filmed and shown on BBC See Hear (2006) as “Music Has No Bars” with British Sign Language (BSL). Along with her music degree, she has been awarded two diplomas by the Associated Board of the Royal Schools of Music: Certificate in Instrumental Teaching ABRSM (2004) and Dip.ABRSM in Flute Performance (2005). Although profoundly deaf from birth in the region of 80-110db levels in both ears, she wasn’t diagnosed until the age of 3 years after her parents realised that she wasn’t talking or responding very well to spoken conversations. She began wearing hearing aids at the age 4, and remembers spending a lot of time playing on the piano in the house creating simple melodies and distinguishing different pitch sounds, compared to the mumbo-jumbo cluster of speech sounds which made absolutely no sense to her back then. Her language development flourished from the age of 8 when she was introduced to Sign Language. She currently wears analogue hearing aids in both ears which enables her to hear the flute and work very well with other musicians. In her dissertation she wrote “Music is not about hearing any more than language is”. Her B.Mus (hons) dissertation on music specialism and deafness was awarded the highest mark in her year and in turn, was given a shield trophy and prize money by the Friends of Royal Welsh College of Music. Ruth has extensive teaching experience, working for Essex Music Services and Mary Hare Schools as a peripatetic music teacher and has entered many students very successfully for music graded exams with the Associated Board of the Royal Schools of Music. In September 2017 she started her weekly role as a specialist Early Years music teacher at Frank Barnes School for Deaf children in London as well as some doing 1-1 instrumental teaching with them. Her musical experiences spans from performing in a small ensemble, quartets, and being a member of the Caprice Wind Orchestra in Essex which has around 50 members. She regularly performs with her father, a professional classical guitarist playing at recitals, weddings and corporate events. She also enjoys a career as a creative practitioner for communities and education – facilitating music /arts workshops for many organisations and sponsors. Venues include the Lyceum Theatre (Lion King), Theatre Royal (Shrek) and the Apollo (Wicked) in London, and has travelled as far as leading workshops in Hungary. These workshops range in age from babies to adults, in varying situations and abilities. Ruth comes from an incredibly musical family, her parents and three brothers are all hearing. Her father is a guitarist, teacher, composer, examiner and adjudicator. Her youngest brother Edward is in demand as a piano teacher, accompanist and is a musical director of a church choir in Chelmsford. Her mother Mary runs Rhythmtots weekly, which is a successful music group for 0-4 years old. Equally both her other two brothers reached grade 8 and diploma levels in pianoforte. Her passion in life is to continue with flute performing, write blog posts on any music related topics with other Deaf artists in the community, spread knowledge, experience and expertise as a musician, artist, teacher and workshop leader. Carmen Fantasy – for flute and classical guitar, with my father Roger. Live in Maldon, Essex.